A squatchy property only 60 miles from Bigfoot Lunch Club HQ is for sale. It is known as Bigfoot's grave due to the assumed death of Bigfoot after the eruption of Mt. St. Helens. 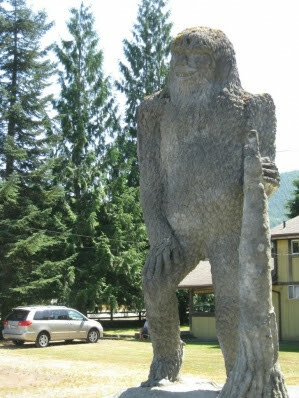 Commemorating the "death" is a 28-foot concrete statue of Bigfoot--did we mention it comes with a helicopter pad? The owners of the defunct roadside attraction North Fork Survivors Gift Shop are selling the shop, nine acres and 1,120-square-foot house, an A-frame house buried in volcanic ash, and of course the helicopter pad. Big foot country! Commercial potential. Let us share how: approx 9.36 beautiful acres w/an 1120 sf home, building lot, North Folk Survivors gift shop, theater w/new roof, Big Foot, buried A frame, rest rooms & outbuildings w/many possibilities, RV park, helicopter landing, food stand, coffee shop, fishing/hunting camp. Across the street from North Folk Toutle River, mils post 19 on way to volcano viewing. Make your plans, make your offer. Cash or conventional financing. We got this news from Portland's own weekly newspaper, Willamette Week. You can read the full article here. It would only be about a 120 mile commute for me to work from there. I'm in! I'm in Nadia. I need a little vacation spot/squatchin' home base ; -). Maybe we can even convince you to join the dark side of the force. "If only you knew the power of the dark side. "- Lord Vader, squatch enthusiast and wookie/sasquatch hunter. In all seriousness though, i know this place and it would be an amazing homebase in the sw wa cascades. My uncle owns property near there, it is remote and beautiful country. Lots of high country lakes overrun with trout, and my only cougar sighting was very near there. I have always thought about buying something in that area, so thanks for showing us this Guy! laissezfairescience, I just want to be able to drop in on the heli-pad. Of course, I would have to get a helicopter first. I would radio in before every landing and say, "Heli-Squatcher to homebase, Guy has arrived." And yes, I would refer to myself in third-person. Lol, nice. Squatch base 1 you are clear for landing. Wish there were more photos of it but it does look interesting.